Instant pot palak paneer recipe is simple, easy to make and delicious. It makes a very yummy curry with rice for lunch or dinner. It also makes a great side dish with Indian breads like chapathi or poori. Palak paneer is simply a very popular and delicious Indian dish made using spinach leaves and Indian cottage cheese known as paneer. 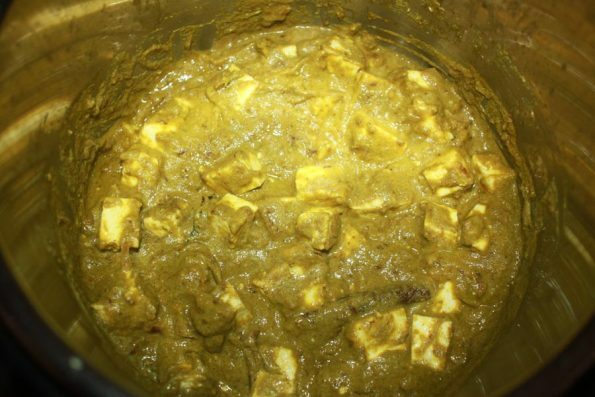 If you do not have instant pot you can buy one here if you wish, or you can try my palak paneer recipes on stove top here – restaurant style palak paneer recipe and easy palak paneer recipe, both very delicious as well! 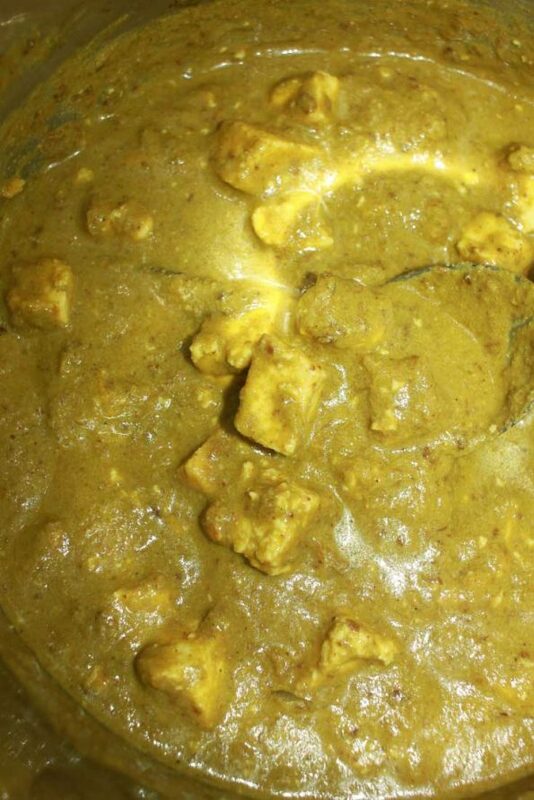 There are many paneer dishes very popular in India and palak paneer is one of the most easy, delicious and popular paneer curry which you can quickly make at home. If you have fresh spinach and paneer at home this is so easy to make. You can make paneer at home using milk and lime juice, but you can also find paneer so easily at any Indian grocery stores. 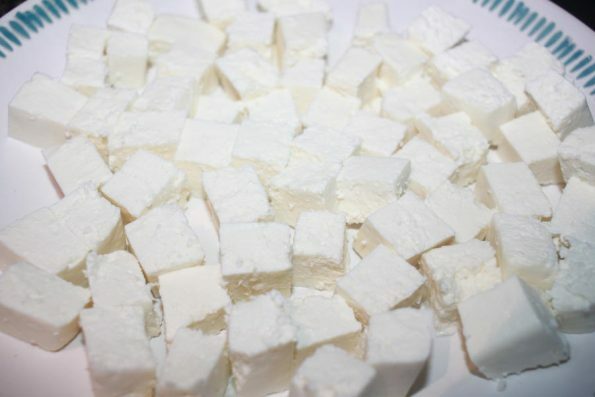 Fresh paneer can be stored in refrigerator for few days while frozen paneer can last many weeks in the freezer. Palak paneer is made using fresh spinach which is known as palak leaves in India and paneer along with few spices. Adding cashews, butter and heavy cream makes the palak paneer more rich and delicious. I have always made palak paneer on stove top and now I have found that making palak paneer in instant pot is even more easy and very delicious too! In fact most of the things can be made more easily in instant pot. Try my instant pot recipes which are too easy to make like this easy instant pot peas pulao recipe, easy instant pot tomato rice, instant pot buttered noodles, instant pot penne pasta in marinara sauce, instant pot potato curry, instant pot vegetable curry, instant pot chana masala, instant pot moong dal fry, instant pot south Indian style sambar etc if you like easy vegetarian recipes. You can see all my instant pot vegetarian recipes in this blog here, all of them are easy and simple to follow recipes. 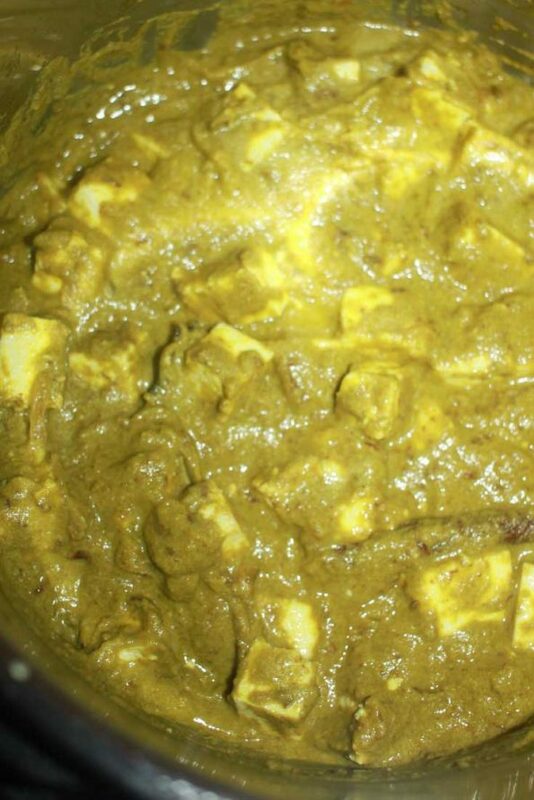 So here is how you can make easy and delicious palak paneer (Indian style spinach cheese curry) following this easy instant pot palak paneer recipe. Instant pot palak paneer is a very delicious Indian vegetarian curry/gravy that goes great with rice and Indian breads like chapathi, poori or nan. 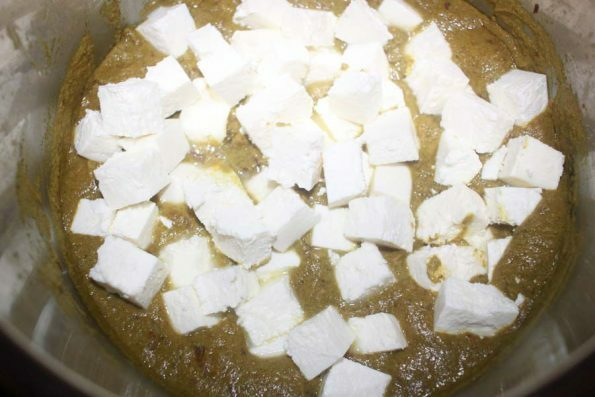 This is made using fresh spinach leaves, paneer (Indian cottage cheese) and spices. Soak the cashews in enough water at least for about 15 minutes in advance. Slice the onions finely, keep aside. 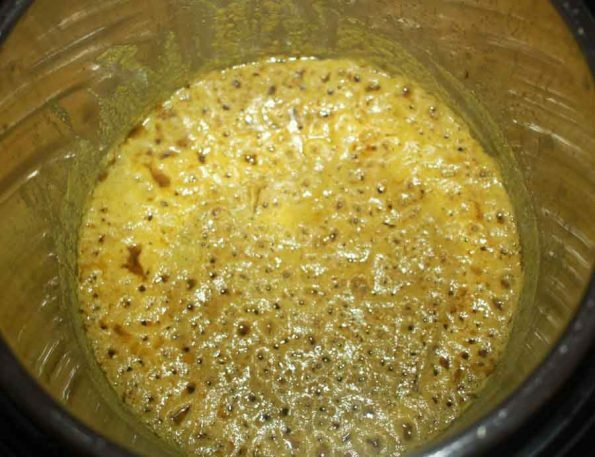 Heat oil in the instant pot (press saute function and adjust to low), add the cumin seeds. 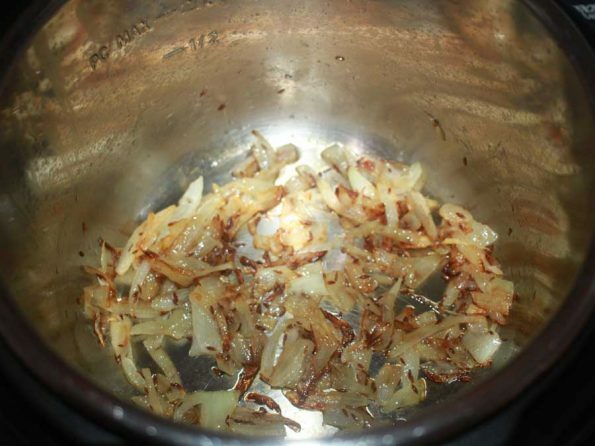 As the cumin seeds are lightly fried, add the chopped onions and enough salt, saute for about 6 to 7 minutes until the onions are lightly browned. As needed you may adjust the heat. You can do this by pressing the cancel button and then press the saute button again and use the adjust button to use low or normal settings as needed. Make sure to stir in between so the onions won't stick to the bottom of the pot. 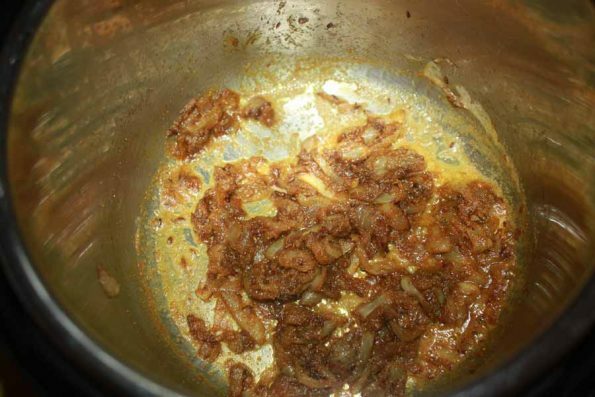 As the onions are sauteed enough, add the ginger garlic paste, mix well and saute for another couple of minutes. Transfer the soaked cashews to a blender (discard the water used for soaking) along with fresh spinach, green chili and 2 cups of water, blend the mixture until very smooth. 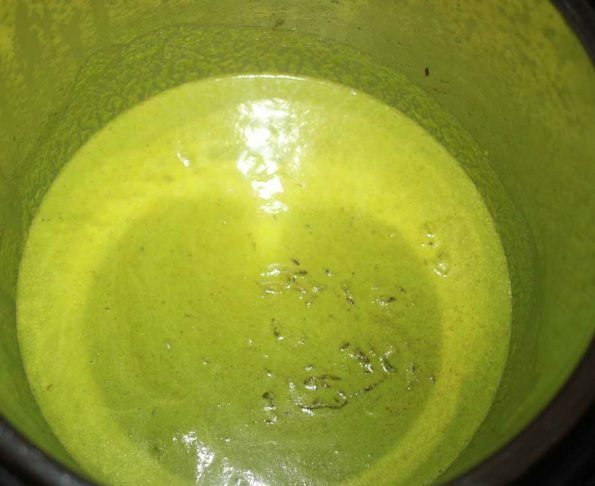 Transfer the blended spinach cashew mixture to the pot, stir well with the onions and add the butter and all the spice powders, mix well and saute the contents for about 1 minute. Add the remaining 1 cup of water and enough salt, mix well. Close the instant pot with lid in sealing position and press manual, cook in high pressure for 6 minutes of time.The instant pot will take few minutes to build up pressure and start cooking. Once the cooking is done, the pot will beep so you will have to wait until then. Once the cooking is completed and the pot beeps, press the 'keep warm/cancel' button and wait for a natural pressure release of about 15 minutes. After an NPR (natural pressure release) of 15 minutes, carefully do a manual release by turning the lid to the venting position slowly and carefully, releasing the remaining pressure gradually. Once the pressure is all released, carefully open the lid, mix the contents. Add the sliced paneer cubes, mix well and add little more water if needed for gravy (I added about 1/2 cup of water for gravy). Press the saute function, adjust to low and simmer the contents for 2 to 3 minutes until the paneer is cooked and soft. 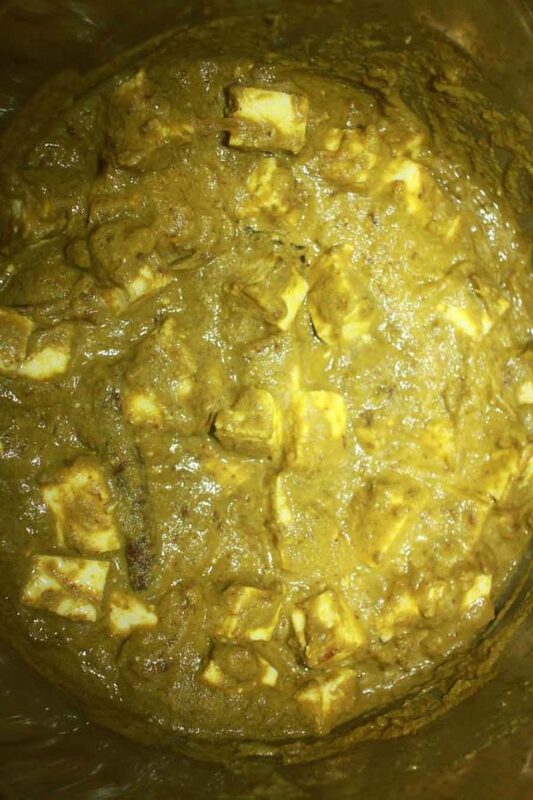 If you simmer it for long, the paneer slices may crumble so a couple of minutes will be enough and as soon as the paneer is cooked, press the cancel button to turn off the saute function.Add the heavy cream (if using), gently mix in the cream and serve the delicious palak paneer curry hot with chapathi, rice or any flatbread as you like. 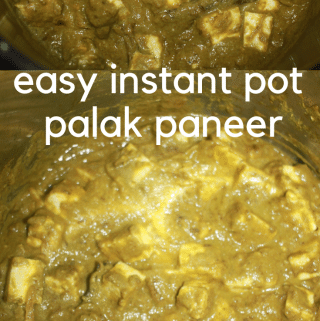 Hope you found this post on instant pot palak paneer easy and helpful in making palak paneer at home using instant pot.